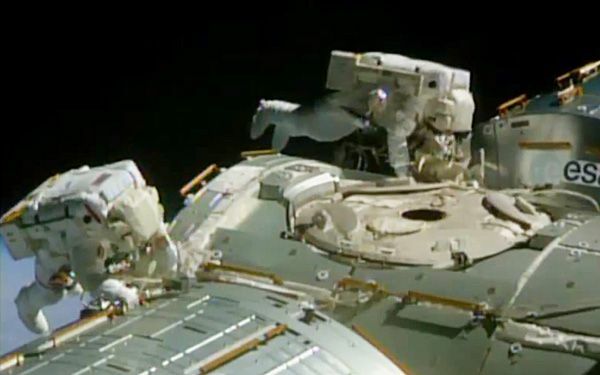 Spacewalking astronauts have routed more than 300 feet of cable outside the International Space Station, tricky and tiring advance work for the arrival of new American-made crew capsules. It was the first of three spacewalks planned for NASA astronauts Butch Wilmore and Terry Virts. Altogether, Wilmore and Virts have 764 feet of cable to run outside the space station. They got off to a strong start Feb. 21, rigging eight power and data lines, or about 340 feet. "Broadening my resume," Virts observed. NASA considers this the most complicated cable-routing job in the 16-year history of the space station. Equally difficult will be running cable on the inside of the complex. The extensive rewiring is needed to prepare for NASA's next phase 260 miles up: the 2017 arrival of the first commercial spacecraft capable of transporting astronauts to the orbiting lab. NASA is paying Boeing and SpaceX to build the capsules and fly them from Cape Canaveral, Fla., which hasn't seen a manned launch since the shuttles retired in 2011. Instead, Russia is doing all the taxi work for a steep price. The first of two docking ports for the Boeing and SpaceX vessels still under development is due to arrive in June, and more spacewalks will be needed to set everything up. There were so many cables that NASA color-coded them but it helped the spacewalkers only so much because they expected a lighter blue for one of the lines. "I worked up a lather on that one," Wilmore informed Mission Control after successfully attaching the first four cables. Mission Control left two cables or about 24 feet worth for the next spacewalk. Four hundred feet of additional cable will be installed March 1 on spacewalk No. 3. "We've got a lot of work still," Mission Control said. "We want to make sure we look after your health and get you back inside now, so we're going to claim victory here." It was the first spacewalk for Virts, who arrived at the space station in late November. He savored the moment as he floated out high above the South Pacific. Spacesuit concerns stalled the work by a day. NASA wanted to make certain that the suits worn by Wilmore and Virts had reliable fan and pump assemblies. Two other fan-pump units failed aboard the space station in recent months and were returned to Earth earlier this month for analysis. Corrosion was discovered, the result of water intrusion from testing. Their suits appeared to work fine. "I just wanted to say thanks to everyone for their hard work and diligence," Wilmore, the station's commander, said once he was safely back inside. Critical thinking challenge: How did color coding help the astronauts? Are cute little gerbils to blame for Bubonic Plague? It has talk of a space mission that has refer to has a astronaut going to space to talk of satellite that was in problem and has to work on the cable to fix it. Being a huge fan of astronauts and space research I really have to give a round of applause to these individuals. They have one of the most difficult jobs to qualify for. 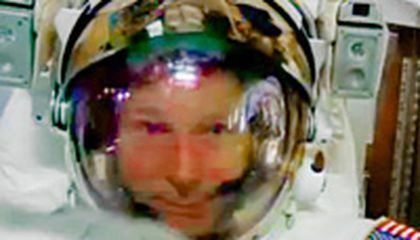 This article shows one of the many aspects of what astronauts deal with and their jobs only get more difficult from there. Dealing with the stress of having to handle equipment worth billions of dollars and experiencing outer-space conditions on a daily basis weighs on these individuals. Yet, they are strong and hard-working and deserve much respect for what they do. Carry on space-men/women! I think that rewiring a space shuttle is very interesting. I believe that it is a very important job. What would happen if the space suit failed? Ms.Clarkson, the story, " Spacewalking astronauts turn cable guys", was a good text. This article is about wiring being set up on the International Space station. They are setting up cabling to bring (well this is what I took) power to the station, which is to be used as a stop for the commercial flight in 2 years. An immense amount of wires is required and with 400 feet they have just started. Due to the nature of the work and amount of time it takes NASA spent a lot of time improving the suits to be safer for it's users. be functioning. It could be less, but I think there will be some fails. Just something NASA could do is to send unmanned crafts to different farther out planets with supplies such as fuel and water to act as stops on the way. Like Hawaii originally was for the US. This is an article about two astronauts, and how they wired cables through space. They say how it's very complicated to do so and how it's probably really advanced and requires lots of skill. This is something cool that someone can go up into space and do this stuff is really cool. This helps them be able to communicate in space to down here. To have people go up to space more often can help scientist and NASA out a whole lot.